Cradle Mountain National Park is a veritable hiking paradise, whether you’re after a short afternoon stroll or a challenging all day adventure. In fact, it’s far too easy to lose hours moseying from one spectacular boardwalk to the next, tracing the curves of this pristine bushland, clambering up to jaw-dropping viewpoints and wandering between ancient forests and blushing meadows where Australian fauna are abundant and a touch of magic hangs in the air. 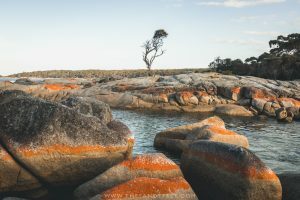 Cradle Mountain was my favourite place in Tasmania, despite the at times dreary weather, and these were my absolute favourite walks in Cradle Mountain. The Enchanted Walk meanders through clumps of buttongrass and bearded trees, where cascades gurgle gently between the undergrowth and a lick layer of spongey moss blankets the forest floor. It’s a short walk but there is perhaps no more perfect name imaginable for this place. Beaneath a light dusting of glimmering raindrops, this forest boardwalk was like stepping into a fairytale. Keep an eye out for the elusive platypus which inhabits the inky pools amongst the forests, and the wombats and paddymelons that emerge around dusk to forage beside the path. For another similarly easy walk through much the same landscapes, the 30-minute King Billy Track which begins near the Peppers Cradle Mountain Lodge is good choice. As far as Cradle Mountain walks go, the Dove Lake Circuit is considered the thing to do. Along with the Enchanted Walk, it’s also listed among Tasmania’s 60 Great Short Walks. It’s short enough that you can comfortably complete it if you’re just visiting on a day trip, it takes you all the way around the lake offering up a perfect backdrop of Cradle Mountain and wonderful views over the surrounding countryside, it can be done as a lazy afternoon stroll for those who arrive later in the day and it offers the optional detour up to Marion’s Lookout for those after epic views and a bit more of a challenge. Marion’s Lookout offers up one of the best views in all of Cradle Mountain National Park. With the stark chiselled twin peaks rising up sharply overhead and the glimmering surface of Dove Lake stretching out below your feet, it’s a great place to sit and take it all in. But be warned, it gets incredibly windy up here and can become quickly shrouded in low cloud if the weather decides to turn. To combine this hike with the Dove Lake Circuit, best is to head left from the Dove Lake Carpark and travel clockwise almost the whole way around the lake before taking the steep rocky scramble directly to the lookout, or for the much shorter version follow the trail anti-clockwise around Dove Lake and take the same trail up. Otherwise, there’s a slightly longer but more gentle route that leads past Lake Lilla and Wombat Pool (literally written Wombat Poo on every single sign which never failed to get a chuckle). One of my absolute favourite walks in Cradle Mountain, this boardwalk weaves through fields of long, golden grasslands, forests of scraggly ash-grey trees and dense clumps of spongey vegetation. It’s best to start at the Interpretation Centre which will mean virtually the entire walk is downhill, but it’s just as beautiful when done in the other direction. Just be sure to glance back every now and again to take in the views of Cradle Mountain as you move further from the lake. The Rainforest Walk is an easy 10-minute trail that leads to a viewpoint overlooking Pencil Pine Falls and is a nice addition to the Cradle Valley Boardwalk from the Interpretation Centre. Admittedly, the morning we set off for Hanson’s Peak in the hope of reaching Cradle Mountain summit, the weather was truly dreadful. Blustery winds, persistent rain and a low, unwavering fog meant we weren’t able to enjoy the views we knew were there, but through the gloom we could just make out the shimmering forms of the many lakes scattered amongst the valleys below. On a clear day, the views must be truly fantastic. Onwards, Face Track passes beneath Cradle Mountain while the Horse Track leads you through the rolling countryside, past Crater Peak and Crater Lake down to Ronny’s Creek and its abundant population of wombats. Hanson’s Peak can also be done as a short one-way hike (45 minutes each way) to enjoy the view, or you can complete this full circuit with the option to tackle the Cradle Mountain summit or Marion’s Lookout along the way. It’s the big one – the rocky, vertigo-inducing scramble to the Cradle Mountain Summit. If you’re feeling adventurous (which you really should be!) this is the hike for you. Unfortunately, wild weather meant this wasn’t on the cards for us, but the views are undoubtedly spectacular. There are a few ways to reach the summit, either via Hanson’s Peak, Marion’s Lookout, the Horse Track or Wilks Lake, all of which lead to the intersection for the summit trail where the final kilometre or so to the top is rumoured to be very rocky, with sheer drop offs and plenty of rock scrambling which can be a little unnerving if visibility is low. Be sure to keep an eye on the weather, wear proper footwear and turn back if things begin to get dicey. Of course, I can’t talk about hiking in Cradle Mountain National Park without mentioning the famous Overland Track. 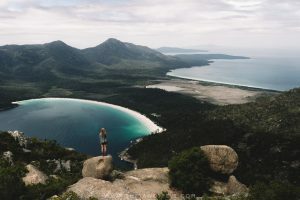 Winding through the remote and pristine wilderness of Cradle Mountain-Lake St Clair National Park, this bucket-list-worthy trek is one of Australia’s great adventures and something that should not be taken lightly. I haven’t done it, yet, but it’s certainly on my list. Bookings are essential. For more information, check here. 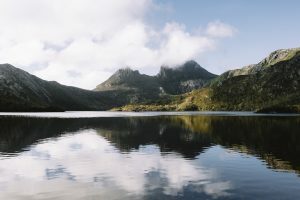 Many of the hikes on this list will only take up about half a day or less, but if you’re really keen to explore, you can certainly combine a few for a full day of wandering through Cradle Mountain’s stunning landscapes, or simply stick to one walk and use the extra time to kick back and relax. With two full days of hiking and highly variable weather (read: wild winds, torrential rain, thick fogs, sunshine and blue skies), this was how we chose to spend our time. Hanson’s Peak – Face Track – Horse Track – Ronny’s Creek – shuttle to accommodation for lunch – Dove Canyon Walk. We had hoped to reach the summit on this day but given the weather, this was completely out of the question. Instead, we spent the afternoon on the Dove Canyon Walk which was nice enough but honestly not as impressive or well-maintained as many of the other trails which is why I haven’t included it in the list above. Proper Shoes | Cradle Mountain’s network of amazingly well-maintained boardwalks and bush trails means solid hiking boots are not strictly necessary depending on which trails you choose to do. Sturdy runners with good grip should be adequate for most walks, but if you’re hiking up the any of the peaks including Marion’s Lookout and Cradle Mountain Summit which involve plenty of steep rocky scrambles, proper hiking shoes are absolutely essential. Also given how often it rains, waterproof boots are just a good idea, whether you’re tackling the harder trails or not. I travel with these Scarpa Hiking Boots which are lightweight, water resistant and super comfortable. Wet Weather Gear | It rains around three quarters of the year out here so chances are you’ll get at least some wet weather during your visit. Along with waterproof footwear, a decent rain jacket will definitely come in handy. After more than a decade with my old Berghaus jacket, I recently swapped to a Patagonia outer shell which has so far served me well and was far more affordable than most jackets on the market. Warm Clothing | Even in mid-summer, temperatures can plummet to nearly zero degrees so it’s best to come with a few warm layers just in case. A thin, cosy merino wool base layer is a good idea (like this one) topped with a fleece or puffer jacket and a weatherproof jacket over the top. In spring, autumn and most certainly winter, be prepared with even more layers to keep you warm. A beanie, gloves and scarf are also a good idea at this time of year. A Map | Honestly, all the trails in Cradle Mountain National Park are very well marked so you shouldn’t have any trouble finding your way, but in case of bad weather where you’re counting down the kilometres until you’re back under shelter, all the trails mentioned in this post are also marked on Maps.Me. Sunscreen | If you’re not getting drenched, you’re probably getting sunburnt! As with all of Australia, the UV risk in Tasmania is very high and despite overcast skies and cooler temperatures, you can still get terribly sunburnt. If you’re heading out for a hike, always apply sunscreen of at least 30SPF, even if it’s cloudy, and be sure to reapply throughout the day. A hat, sunglasses and t-shirt or long sleeves are also a good idea.